The Ardh Kumbh Mela is held every six years, while the Maha Kumbh Mela comes after 12 years. 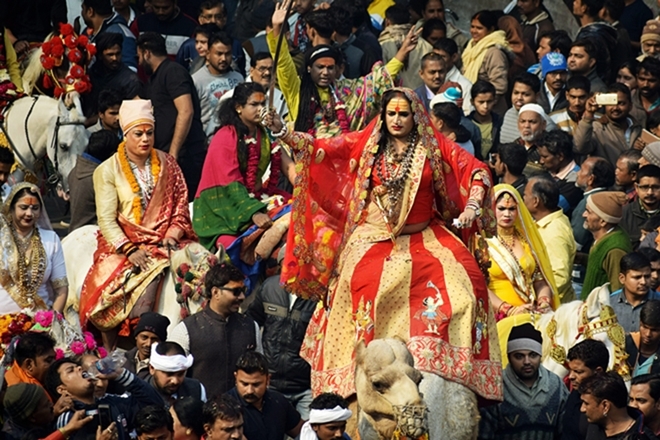 The Maha Kumbh Mela festival is held at Prayagraj while Ardh Kumbh Mela is organized in the four riverside cities of Haridwar, Prayagraj, Nasik and Ujjain. Nearly 120 million visited the last Kumbh Mela in 2013, a number which is expected to be surpassed by this year’s festival visitors. The largest temporary city in the world has been set up along Prayagraj. It is spread over an area of 45 km, more than double compared to the 20 km radius from 2013. An Integrated Control and Command Center has been established to facilitate the control, public safety, and traffic. Two Control and Command Centers are already functional. For the first time, the Centers will use of artificial intelligence for crowd management, and over 1,000 CCTV cameras will be used to monitor movements. For the first time, pilgrims will be arriving via land, air and water routes. To facilitate the immense number of pilgrims arriving for the festival, 800 special trains from various stations of Allahabad district are introduced in addition to the regular trains run by the North Central Railway. New flights have also been introduced. Furthermore, The Inland Waterways Authority of India set up four floating water terminals and deployed two vessels to facilitate pilgrim movement. The government has also introduced an airboat service from Varanasi to Prayagraj. A new road leading to the Akshay Vat tree, a banyan tree held sacred by Hindus, was built to facilitate pilgrims. The Akshay Vat, which has been closed for 450 years, will be open for visits. Other novelties include Uttar helicopter tour services, virtual reality experiences, 4,000 hotspots that will provide high-speed Wi-Fi, etc.